This is a type of brown seaweed (or ‘phaeophyte’), that is easily discernable from other species. The portion that is commonly seen above the water is the pneumatocyst (aka the bulb or float), which is gas-filled and allows the seaweed to keep reaching up into the surface waters to photosynthesize. 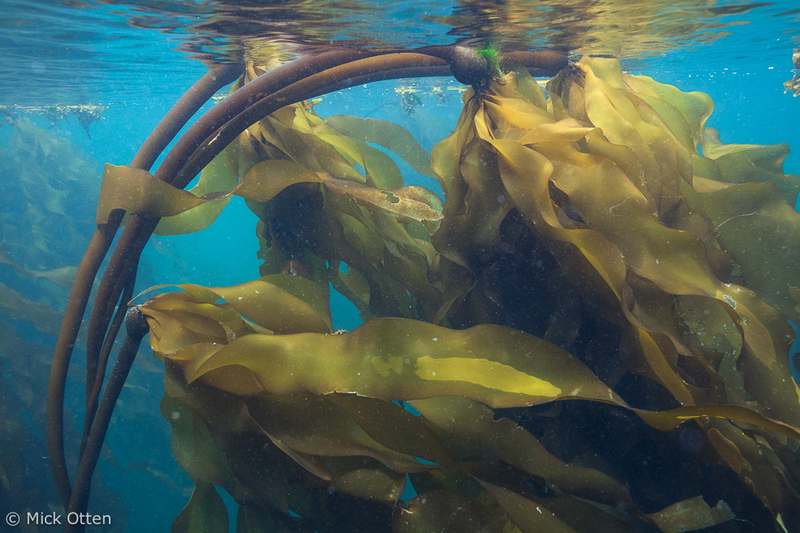 The portion of the kelp where the majority of the photosynthesis takes place is in the blades – these can grow to 3m long off the top of the float. Bull kelp grows on rocky substrates and is attached by a root-like structure called a ‘holdfast’. The long stipe (or stem) that connects the float to the holdfast is hollow in its upper 1/3 can reach lengths of up to 36m. Bull kelp grows from Alaska’s Aleutian Islands to Point Conception, California. It is prominent around the Vancouver Island, and can be seen growing in upper subtidal zones, wherever there are suitable rocky substrates and cold nutrient-rich waters. Pacific Northwest Coast inhabitants have traditionally utilized bull kelp for many things. Often the float was used as a container for storing or transporting goods such as eulachon oil. The tapered end of the float, leading to the stipe, was cut off and a wooden plug would seal the float-container. Additionally, the float was used in the making of halibut fishing hooks. Once the hooks were carved from spruce or fir to the right thickness, they were put into the floats that were then filled with water or urine, and plugged with moss. This was then steamed in a fire overnight, then the kelp float was split open and the steamed wood pieces were bent and pressed into a wooden mold. Bull kelp was also used to make fishing, harpoon and anchor lines by soaking the stipe in fresh water, then stretching and twisting it for extra strength, and finally drying. Many lengths of this were tied together to make long lines. Other items commonly made of this multifaceted resource, include woven baskets, nets, ropes, trumpets and rattles. Squamish fishermen were known to use bull kelp blades to wrap their fish in while out on the water, keeping the fish moist and fresh. Comox first peoples used bull kelp blades to line pits when cooking to flavor food and generate more steam. Modern uses include wrapping the blades around fish prior to cooking, making trumpets, pickling stipes and drying and eating the blades. View presentation exploring ethnobotanical uses of bull kelp and how to make bull kelp pickles here. Druehl, L. D., and Clarkston, B. E. Pacific Seaweeds: A Guide to Common Seaweeds of the West Coast. Updated and expanded edition, Harbour Publishing, 2016. Turner, N. J. (2007). Plant technology of First Peoples in British Columbia. Victoria: Royal BC Museum. Springer, Y., Hays, C., Carr, M., and Mackey, M. (2007). Ecology and management of the bull kelp (Nereocystis luetkeana): A synthesis with recommendations for future research. Lenfest Ocean Program. Department of Ecology and Evolutionary Biology, University of California, Santa Cruz. Swinimer, A. (2017, October 24). Seaweeds. Lecture presented in UVic Ethnobotany (ES 421).